The Grandeur Collection Down Blend was originally created for use in technical outerwear and, as such, exhibits exceptional performance and durability in the bedding market. This luxury pillow is filled with our premium white goose down combined with down alternative for added support. The addition of the down alternative also reduces drying time making the pillow easier to care for. 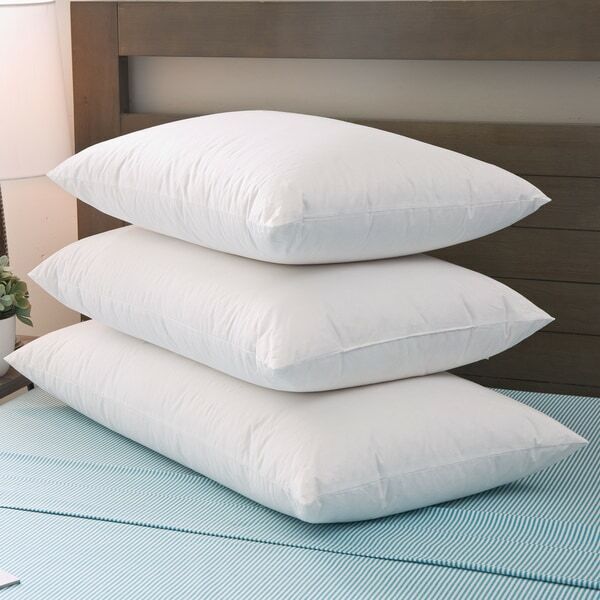 A 233 thread count 100 percent cotton shell with 550 fill power white goose down fill provides incredible softness, comfort, and a luxuriously firm support for a tranquil night's sleep. Sizes available include Standard, Queen, and King, so they'll be perfect for any bed set or adding extra comfort to your favorite sofa. When it comes to extravagant comfort and affordability in a pillow, look no further than a one of a kind Down Blended Luxury pillow. Treat yourself to eternal bliss by adding this exceptional pillow to your bedding collection today. I love the pillows but my husband doesn’t. I had to move them to the guest bedroom and I am still trying to find the right pillows for him. Our guests always compliment them after sleeping, so I split the rating. I give them a four, husband gives them a one. Wanted reasonably firm pillows. Combination down and down alternative should provide benefits of down and firmness of the alternative.